We had a rose petals congratulatory send off after the wedding ceremony. We bought a couple bags of rose petals from Produce Junction for a 1$/ bag! 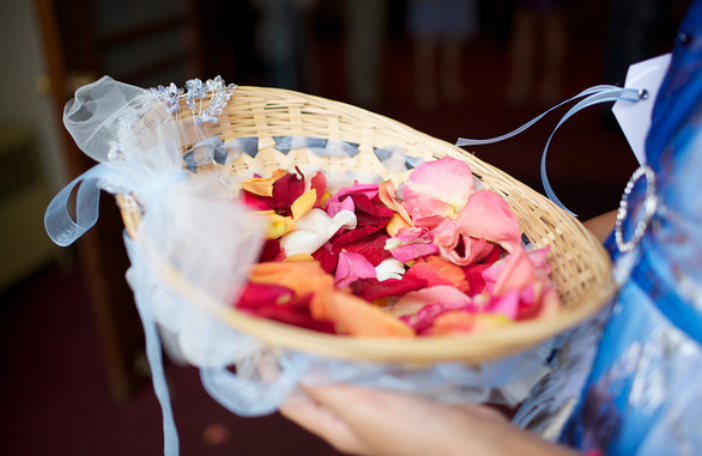 My Aunt Tania decorated the baskets and my cousin's held the baskets as the wedding guests grabbed a handful. The white, yellow, pink and red pedals didn't match my blue and silver theme, but they looked amazing in the pictures and were romantically beautiful! So fun! Some things you want to keep in mind when planning your send off: Is it easy to clean up? Is it good for the environment? Check with the vendor to see what you are allowed to use. 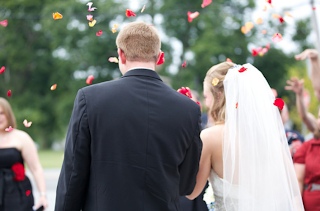 Some ideas: Rose petals, bubbles, sprinkles, streamers and confetti. We had a pop out streamers send off at the end of the reception. We bought them from Party America because they had the best deal. All the little things you buy for your big day add up so I made sure to shop around and to always look for coupons or free shipping. 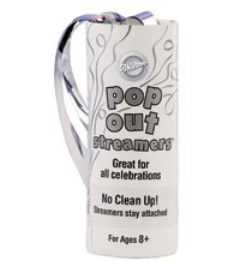 The pop out streamers look great in pictures- close to FIREWORKS! 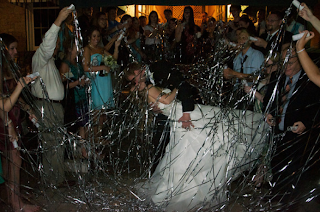 The vendor also liked that the streamers stay attached so clean up is easy. Side note- make sure you test things out before hand. We were at our engagement session with David (our new photographer who photographed the wedding) and he wanted a picture of us shooting the pop out streamers. He was going to count to 3, well Matt popped the streamer on 1 and it was a DUD. After laughing and thinking "Oh Crap.." I tried some other streamers at different angles to figure out what would look best in pictures. Turns out you can't hold the streamer straight up, you have to hold it out. To coordinate the send off we had our DJ announce the send off would happen at 10:30pm and the guests got a reminder 3 songs away. The person handing out the streamers needs to communicate how to use the pop out streamers and when to let the go. It didn't go as we thought it would because most of our guests had a fair amount to drink, but we got a couple good pictures.